I feel both blessed and inspired each time I come across business men who admit that their heart does play a major role in making major decisions both in their personal and business life. Gene Thompson is one of these men. He is a successful man and the managing director of a dynamic, privately owned manufacturing company, Triple M Holdings. His business which currently employs around 145 people extends services nationally and internationally. The respect he has for his team and the equal respect he has gained particularly from his long term employees and clients, together with consistent results and growth over many decades, are a true reflection of what this man is all about. His commitment to personal and spiritual growth has not only enriched his life but the ripples of his commitment are infecting and affecting those here and abroad in the most positive way. My curiosity was really aroused and so I asked him what are the keys to his success in this modern day world, and his answer was "Core Values", some of which he shared and defined below. For Gene the first value is Self Responsibility. It’s about accepting responsibility for all the events and situations in life rather than blaming others. In doing so we take back the power and therefore we have the opportunity to put right the so called wrongs. Rather than taking people on board and trying to change them into something or someone we want them to be, we need to be in allowance. Allowance is about allowing others to be who they are and supporting them in their strengths so that they can overcome their so called weaknesses and become their potential. The benefits of this are often that they rise above the rest and provide the very best not only for themselves but for others. Total Honesty speaks for its self. When we are honest with ourselves we can be honest with others and together we can work from a place of Integrity. Gene feels that we are on the edge of a business revolution where integrity will be the difference between businesses rising and businesses falling. Self Love …Where does love fit into his life and business? According to Gene, Self love is nothing more (or less) than being okay with the heart of who you are, or ‘Standing Alone’ which means being at one with Source, or reaching the point of not being influenced by anything or anyone else outside of oneself. In other words not worrying about the opinions of others and being able to stand firm with what feels right for you. This 'feeling stufff leads us to the next important factor – Tithing. Gene believes that "What you give, you get. Or, if you want it, you give it." For him the 'gift of money is the gift of love'. This is so close to his heart that following the second bombing in Bali he stepped up and gave a substantial amount of money that enabled the building and establishment of an educational facility for financially challenged children. When asked what impelled him to donate so much money his answer was that "It felt right". He expects nothing in return. His gift is totally unconditional. Since its completion in February 2007, Campuhan College in Ubud has provided part and full time training, retraining and education for over two thousand Balinese students; proving that through every adversity there really is a seed of opportunity - if we choose to look for it. These young people are proof that we can choose to be a victim or, we can choose again and become a victor – Great examples of 'I'f it’s to be, it’s up to me'. And let’s not underestimate the possible ripple that takes place when helping just one person or one project. Often the ripple of such good deeds or seeds are spread further than our mind can imagine, often becoming a wave or even a tsunami of love and support that influences millions. 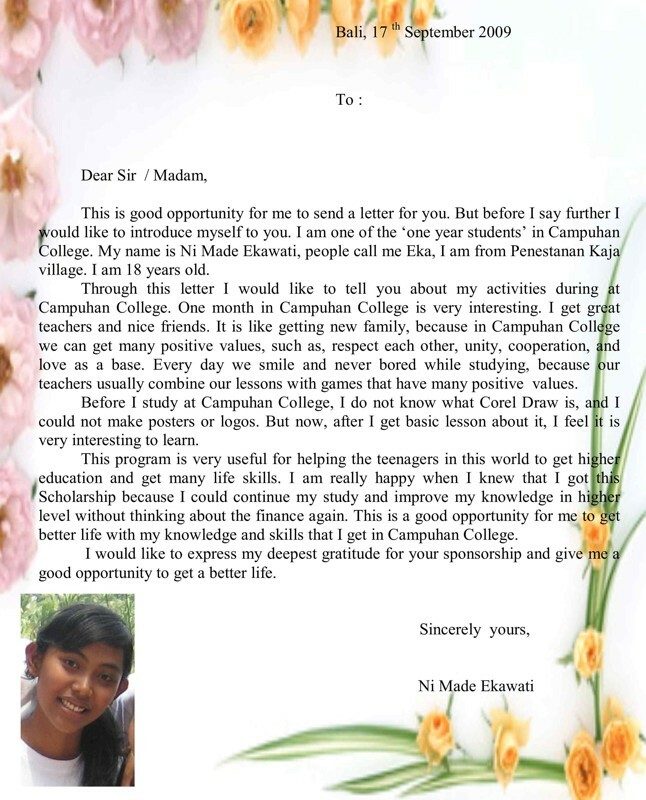 Through the gift of Gene’s original donations, Campuhan College has gone on to become the Karuna Bali Foundation, a non profit Indonesian organisation on the brink of making significant changes in the lives of potentially tens of thousands of young people. 2017 - ten years on, from providing sponsorship education to so many young people, Karuna Bali Foundation has three primary functions: Teacher Training which offers the principals of the UNESCO endorsed “Living Values Education” Program to Indonesian school teachers to assist in opening the minds and realising the potential of their young individuals. This is an ongoing program to help under educated teachers improve their skills, knowledge and resources to enable them to embrace Living Values and give their students the best possible opportunity to learn and grow. One trained teacher can benefit students for decades. The College’s ongoing educational media classes are developing an educational material production program that will have world wide application. EduCare is taking young children’s education and care out into the community. A volunteer program whereby scholarship students, teachers and volunteers take the principals and programs designed by Campuhan College into disadvantaged communities to upgrade and support challenged schools. Can you imagine how it must feel to know that you have been responsible for starting the momentum of a venture that will eventually reach into 17,000 islands and hundreds of schools and communities? With the growth of Karuna Bali Foundations activities assured, it is apparent that it will require significant funding for the next few years, Triple M is inviting SE Qld business men and women to adopt this program as a regional effort to help our neighbours. And all donations over $250 are tax deductible. Information on this regional fund is available from Karuna’s Australian office on +61 7 4169 0301 (within Australia, 07 4169 0301). This website provides full information and a wealth of pictures, videos, student testimonials and details of the organisation’s work. I challenge you to take a good look at the great work that is being done, then do your self a favour and take action. As this great success story demonstrates, every small deed has the potential to become the sweet fruits that were once the seed of a dream. 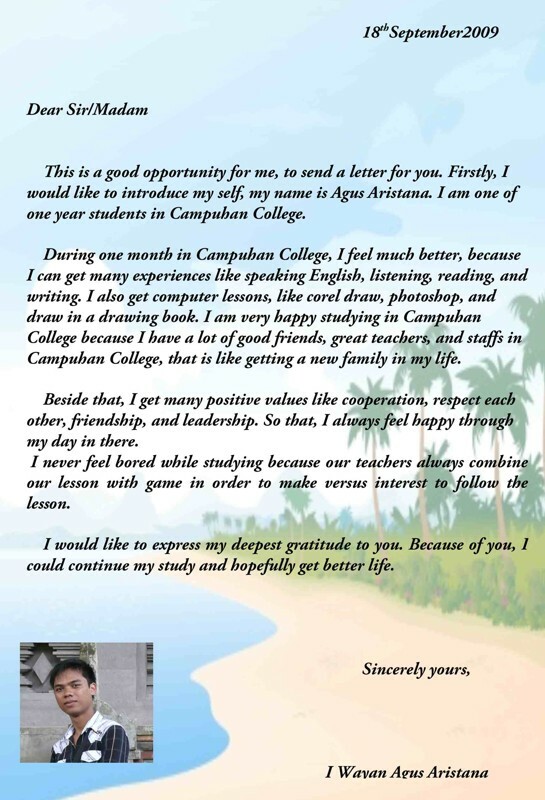 Immediately below are letters from Campuhan College students expressing their thanks - click on a thumbnail to view in full. It is Saturday morning and I have been invited to attend a preparatory meeting at Campuhan College in Ubud, Bali, for the Rural Village Educare Program. The meeting starts at 10:30am sharp. When I arrive at the college, the place is silent. Not knowing what to think, I sneak quietly up the stairs to the upper hall to find about 18 college students in meditation. This is how they start their meetings and I'm impressed! Ten minutes later, and the students are designing a program for the next day, Sunday, that they will bring to youngsters in a school in some remote village called Jatiluwih. The director of the program, a visionary young man of 25 called Scholastica, has come up with the basic design for the program to address the body, mind and spirit. This, he explained, creates and maintains balance within. This Saturday morning is like any other Saturday morning for these 19 - 23 year Campuhan College students. Students decide what team they want to be on: the English language team (addresses learning and therefore the mind), the games team (which moves the body), the story telling team where the youngsters get to act out the story (which addresses the creative aspect of the mind), the art team (which makes use of the mind and spirit) and the reflection team (which is a guided meditation and addresses the spirit). Great detail is given to the design of each team's program - what will be taught in the English language and how, what games will be played, what story will be told, and what guiding meditation will be given. Everyone is invited to comment until everyone is in agreement. This planning process takes two to three hours. 6:45 Sunday morning - the hour everyone has agreed to meet again at Campuhan College. The students arrive promptly one after another on their motor bikes. Video and camera equipment is picked up from the office upstairs and we're on our way. About one and a half hours later, we arrive at a small town in the hills of Bali, called Jatiluwih. The area is breathtakingly beautiful and almost has an atmosphere of otherworldliness about it. We climb off our motorbikes and are greeted enthusiastically by a group of ten year old kids. They are neatly dressed in clean clothes, barefoot with great big smiles from their hearts on their faces. Their enthusiasm is contagious and a deep gratitude to be able to spend the day with these beautiful children, fills my heart. As soon as they see us they get busy - clearing the class room where we will spend the morning with them. They pick up brooms which are tiny and have very little brush left on them and start sweeping the floors. Furniture is moved to the walls to make space in the centre. Everything is done with a smile. They are like beautiful butterflies, these children. Nine o'clock sharp, and we begin the morning with a song "I am a peaceful star, I am". It is sung with all the open hearted enthusiasm that I so love about these kids. This is followed by a lesson in English language. One of the college students writes the days of the week on the blackboard, which isn't that black anymore. 'Monday, Tuesday, Wednesday......' etc. The leader of the team reads out the days in English and the children repeat after her. In unison, their voices are not at all shy but strong and joyful. Then they are taught 'before and after'. Each child is asked to come up to the front of the class and I get to ask each a question: 'What day is before Monday? What day is after Friday?' etc. If the answer is incorrect, the rest of the class helps out. Some are shy, some are proud that they know the answer and respond in a loud and clear voice and everyone of these children is so focussed, eager to learn and to get it 'right'. After about an hour and a half of English class, we move outside for the games. A string is strung like a wash line between two buildings and pieces of rice crackers are hung on strings from the 'wash line'. At a distance of about 20 yards, a couple of children are blindfolded, turned around and told to move forward towards the rice crackers, under loud guidance from their peers. They have to eat the rice crackers without reaching for them with their hands. One kid hates the taste of the rice cracker and spits it out in disgust after he reached his goal, under loud laughter and applause from his team. Next, we move into story telling with new team leaders. A story has been translated from English into the Indonesian language by someone of the team and is now narrated in Indonesian. The children get to act out the story and everyone howls with laughter. Then the children are asked what the 'moral' of the story is - sometimes there is more than one lesson and they all get it. Art is the next item on the agenda of this morning. A bundle of crayons is spread out on the classroom floor. Each child is handed a package, which consists of a red plastic envelope that contains paper, a small notebook/diary, pencil, pen and an eraser. They take out a sheet of paper, move to the center of the floor and begin to draw with the coloured crayons. I am astounded as to the quality of their art for kids this age. One draws a turtle with amazing detail and shades of colour, another draws a typical Balinese farming scene of a farmer and his oxen ploughing a rice paddy, some draw butterflies, etc. Our morning with these children has flown by. It is almost noon and there is one more thing left to do. One of the team leaders asks for a volunteer to say the closing prayer. A boy eagerly raises his hand and proudly comes up to the front of the classroom. He is handed a paper upon which is written the prayer in the Indonesian language: "Terimah kassi, Tuan", is repeated after each paragraph — "Thank You, Lord", while Scholastica accompanies him softly on the guitar. My heart melts even more - I don't want this morning to end. I am so humbled by these incredible children and my heart is as big and as open as the sky, as the prayer ends. The kids shake hands with each of the team leaders, thanking them for the time spent together. It's been a high energy morning and everyone's had so much fun. The Oneness was palpable, the Joy amazing and the Love incredible and so much.... so much gratitude from these children!! After our time together comes to an end, the furniture is put back and the classroom is tidied up. We all leave together — the kids go home and the team leaders gather for lunch nearby at a local warung (local restaurant), where delicious lunches are served for about $1.50 a plate. The purpose of this lunch gathering is to discuss any observations that were made during the morning, with the main question: where is there room for improvement? was our purpose — to teach these kids in a fun and loving way — achieved? did we create a 'safe' environment for them to learn? what needs to be done differently? and also - where did we do well? Again, everyone's comments was welcome, including mine. My admiration is huge — for this project and especially for the Campuhan college students who give freely of their time every weekend in order to facilitate a fun learning experience for these children who live in rural, and often remote, villages and to give these children a chance to expand their lives. The sense of community service, their creativity and genuine Love and care from the hearts of these college students truly is an example to the world. I Love these students and I Love these children and I will return. I am deeply grateful and honoured to have had the opportunity to learn from these wonderful people that are the future of this country, Indonesia. First before I don't know how to use computer, now I can use it more better, and even I can give some knowledge to other people, with English. After I join Campuhan College I became more confident and better in talking with foreigners. The benefit that I feel is good for my development career, where I can learn more about computer technology. And all at once could be my source of learning. 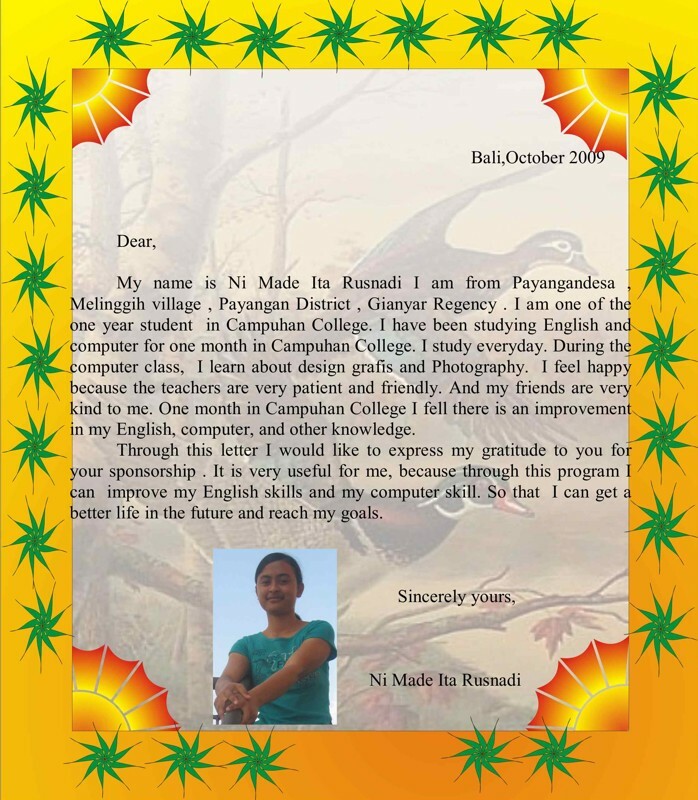 My relation with other become wider and increases my self confident, I can received some knowledge in Campuhan College. Now it is easy to give people a bit of source from what I learned to my friends at work, it is very important and good because it helps my career. That gives a good job ,a high salary after I graduate from Campuhan College. And Now I like my job because it suite with my level that I study in Campuhan College, all at once. They trusted me to became a Graphic designer at Tabra International, it is a jewelry design company. That owned by a Californian. When I was at Campuhan College I’ve got a social project at Jatiluwih, by giving knowledge about English subject to the kids there. Although the help that I give to them is not so much, I am to use my knowledge. After graduating from Senior High School, I was confused. I didn’t know whether working or continuing to study. I didn’t have enough money to continue my study; of course the cost is really expensive. I didn’t have any job experience as well. So , what should I do? 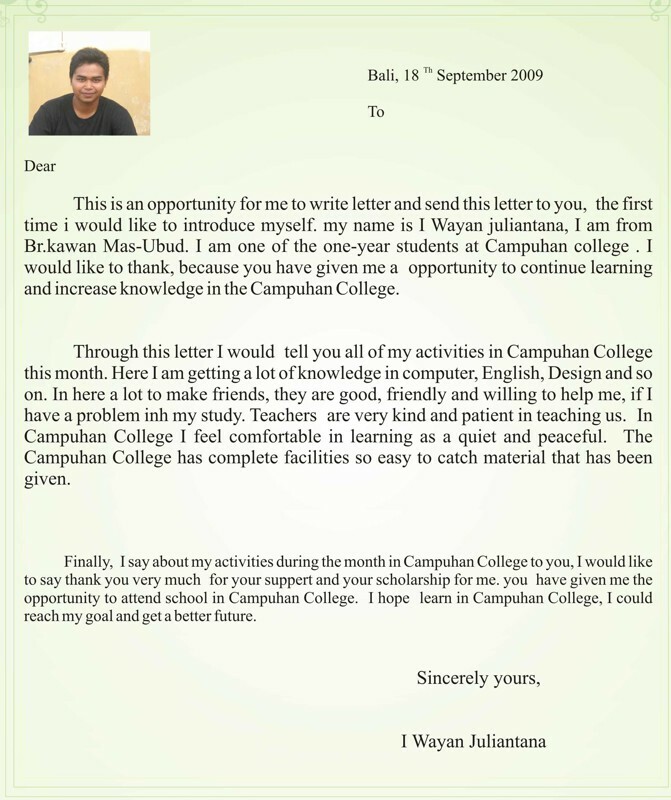 Fortunately, then I got an opportunity to continue my study at Campuhan College. I feel many benefits that I get, especially in English and Computer. 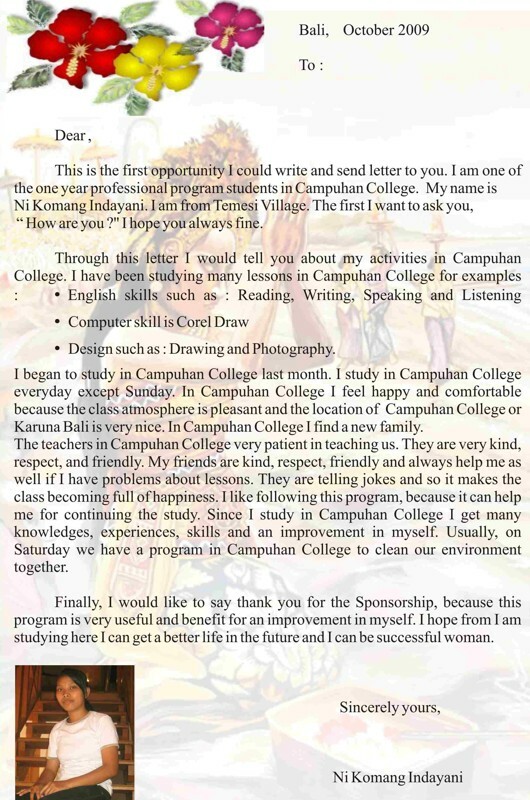 When I was at Campuhan College step by step I start understanding about English and computer that I didn’t know before, I feel more confident than before. My friends used to help me if I didn’t understand the subject, and so did I. We shared each other. What I studied at Campuhan College bring big influence at my job now. Even right now I am still studying some new computer programs such as Solidwork 2003 and Indesign Cs2 that I didn’t get at CC. That is a challenge for me because at work I have to use those programs. Now, I work at CV. Masa Kini, a big furniture company owned by a French and his wife who are Indonesian. My job over there is draw furniture design such as bed, cabinet, chair, etc. At the first month , I felt really uncomfortable, may be just need bit time to adapt with the atmosphere. Time passed by, now I feel more comfortable. The most interesting thing is when I got my first salary, I was very happy and I am proud of myself. There for I would like to say thank you so much for CEO4 Teens, Karuna Bali and Campuhan College, because of it’s help I can be my self as right now. 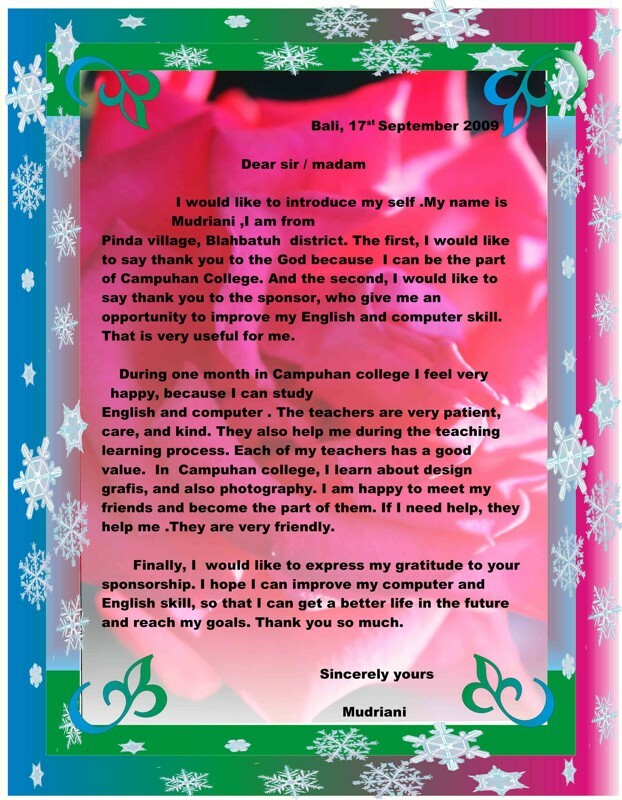 I can not say anything more because of the blessings Karuna Bali Foundation , CEO4Teens and Campuhan College. I feel myself and my life better than yesterday. Once again thank you very much.